This is one of those little nuggets that you might not realise you need to know, but will end up using it all the time now that you know! 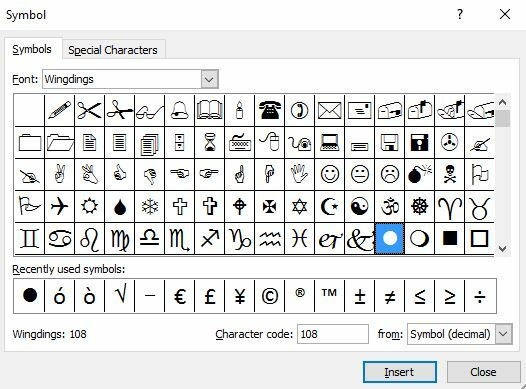 Choose the symbol you want to use, click Insert and Close and the symbol will appear. Alt+7 gives you the small black circle. To change the colour you can go to the Home tab and select the font colour you’d like to use. Alt + 9 gives you the hollow circle. Again you can change the colour as above. Note: You must use the numeric keypad for the above keyboard shortcuts to work.